wood, inkjet prints, paint, lights, lcd screens, media players, speakers, transformer. 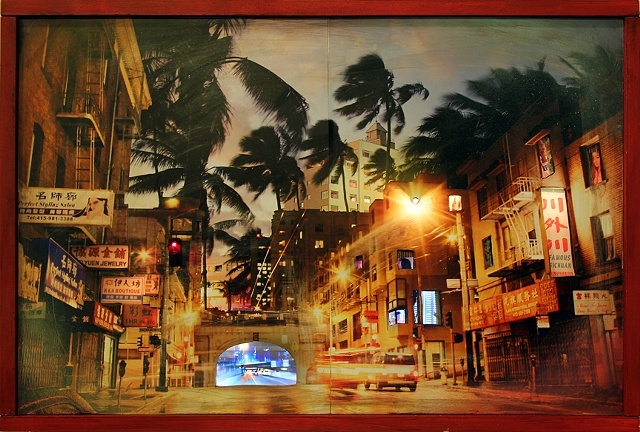 This wall piece is about my attraction to the beauty and differences found in cities--Miami (background image), SF (foreground image), and many international cities--Tokyo, Shanghai, Dubai, Paris, etc... I purposely exaggerate the cultural mix that happens in international cities in this wall sculpture, through the use of image, sound, and video.